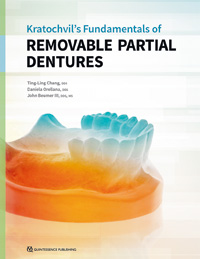 In the 1960s, Professor F. J. Kratochvil recognized the importance of biomechanics in removable partial denture (RPD) design and used these principles to develop a new design philosophy. This "RPI system"-a clasp assembly consisting of a rest, a proximal plate, and an I-bar retainer-changed how clinicians approach partial denture design and is now used throughout the world. This textbook provides an overview of Kratochvil's design philosophy and the basic principles of biomechanics it is based upon. Topics include components of RPDs and their functions, design sequences for maxillary and mandibular RPDs, and techniques for surveying and determining the most advantageous treatment position. A chapter dedicated to digital design and manufacturing of RPD frameworks highlights new technology in this emerging field. Additional topics include optimizing esthetic outcomes through attachments and rotational path RPDs as well as applying the RPI system to patients with maxillofacial defects. The authors provide illustrations of clinical cases throughout the book as well as an illustrated glossary of prosthodontic terminology. This textbook will prepare students and general practitioners to design and fabricate a biomechanically sound RPD framework for just about any dental configuration they encounter. This book presents a review of demographic changes in the partially dentate population, the increasing availability of alternative treatments, and evidence for the long-term effectiveness of partial dentures. In addition, it provides evidence-based guidelines that practitioners can apply to the design, preparation, completion, and maintenance of removable partial dentures in their everyday clinical practice.